Tate Modern’s Anni Albers exhibition ends in 2019, and in so doing helps mark the centenary of Walter Gropius’s founding of the Bauhaus in Weimar. There will be celebratory events throughout the world for the twentieth century’s most famous and influential design school, and in Germany two new Bauhaus museums will open. Anni Albers became a Bauhaus student in 1922 and was head of its weaving workshop for the couple of years preceding the Bauhaus’s closure by the Nazis in 1933. For those interested in the Bauhaus, she has long been a member of its pantheon, but having this solo exhibition at one of the world’s leading art museums justifiably establishes her with a wider audience. Strictly speaking, re-establishes, as she was the first textile artist to have a solo show at MOMA, New York in 1949. She died in 1994, and the Tate Modern exhibition is a survey of her entire career as a designer and artist. After completing the Bauhaus preliminary course, Albers wanted to enrol in the glass workshop, but, as with almost all female students (Marianne Brandt being a notable exception), she was channelled into weaving, in what became known as the “Women’s Workshop”. The Bauhaus was generally liberal and progressive, but this denial of equal opportunities to female students has been the subject of strong criticism. 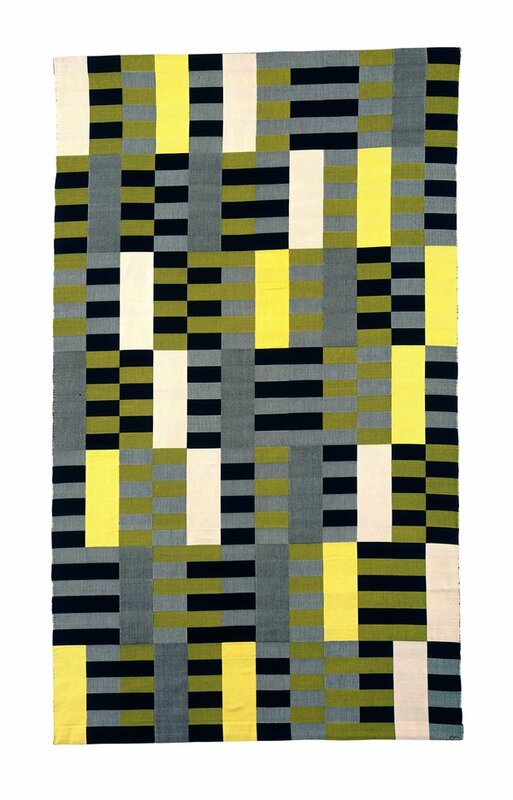 Albers became committed to turning the traditional craft of weaving into a Modernist artform. She was the epitome of a Bauhaus artist/designer: her work consistent with the Bauhaus’s ethos, practices and Constructivist aesthetic. The workshop approach meant an understanding of materials through experiment and imagination. The exhibition shows a sample (and historical photograph) of her diploma piece: a wall covering produced for a trade union auditorium. The black and white threads were interwoven with cellophane, giving a vibrant, shimmering effect. She attended Paul Klee’s colour theory classes (a page of her notes is exhibited) and her sensitivity to colour is present throughout the exhibition. A palette of greys, blacks, whites and yellows is quiet and subtle, but when she restricts herself to red threads, there is a blaze of fierce intensity. Born in 1899 as Annelise Else Frieda Fleischmann, in 1925 she married Josef Albers, destined for fame as painter, colour theorist and teacher. He was a fellow student and later a junior Bauhaus Master. Together, soon after the Bauhaus was shut down, they crossed the Atlantic to rural North Carolina, where both took up teaching posts at the recently formed Black Mountain College, participating in a second legendary teaching institution for the arts. It was here, in the thirties and forties, that Anni Albers began a weaving workshop, using Bauhaus methods with her students, some of whose precise visual and written notes are displayed: meticulousness seems to be an example weavers set for us all. Anni and Josef Albers made a number of visits to Central and South America, and the pre-Columbian weaving of Peru profoundly influenced her. This culture never had a written language, and weaving was a form of communication. I found this a fascinating section of the exhibition, and a work such as Red Meander (1954) has a wonderful, seemingly ancient, maze-like quality. In the 1950s, after moving to Connecticut when Josef Albers was appointed a professor at Yale, she increasingly used her craft as a medium for fine art, calling these works ‘Pictorial Weavings’. Are they equivalent to the best non-figurative Modernist paintings? On the evidence of this exhibition, I think the answer is a resounding yes. This was a personal project and there are entertaining pieces where rickety grids are subverted by threads that intervene like sparks. During this time, she also continued as a designer, and did not forget the Bauhaus position of using industrial processes to make good design available to more than the moneyed few. The exhibition shows her designs for the Knoll Textile Department, and they are still in production today. The Bauhaus idea of architecture as a unifier for all arts and crafts was adhered to when Gropius commissioned her to design textiles for the accommodation part of the Law School building he designed for Harvard. On display is a bed with an Anni Albers bedspread that helped a lucky student stay warm in an aesthetic and art-historical way. In the early 1960s, weaving became too physically demanding for Albers, and she switched to printmaking. The exhibits include her use of an embossing technique to produce white on white prints: small reliefs that deserve recognition as well executed Minimalist artworks. The exhibition has clarity in its organisation and exhibition text, and a good balance between artworks and documentation: e.g. notebooks and photographs. It comprehensively shows Anni Albers’s work has an important place in a visual culture affirming the Bauhaus precept of design closing the gap between art and daily life. Robert Richardson is a visual artist and writer living in Leicestershire. His work is included in Artists’ Postcards: A Compendium (Reaktion Books, London) and Leeds Postcards (Four Corners Books, London). He recently had a solo exhibition of photographs at the Museu Municipal in Faro, Portugal, and is a member of the Biennale Austria association of contemporary artists.